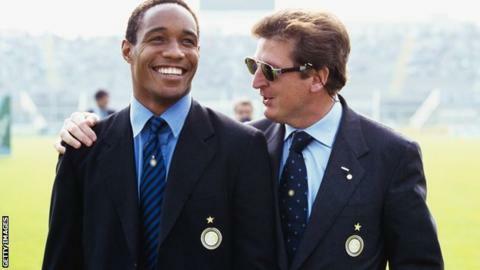 Former Inter Milan midfielder Paul Ince has said the Milan derby has lost some of its appeal because both teams are struggling in the Italian top flight. The ex-England international played for the Nerazzurri between 1995 and 1997. AC Milan and Inter have won 18 Serie A titles each, but sit seventh and ninth respectively going into the weekend. "It's like Manchester United v Arsenal compared to 10 years ago - it's not as big now because of the players in it," Ince told BBC Radio 5 live. "The rivalry is so unique. The fans are so passionate - AC Milan are known as the aristocrats and Inter Milan have been known as the paupers. "We used to kick off at eight o'clock on a Sunday and it was always delayed for 10 or 15 minutes because there was so much smoke inside the stadium from fireworks and crackers. I couldn't see my midfield partner." Inter finished fifth last season, missing out on a Champions League place, and honorary president Massimo Moratti resigned last month. Moratti, whose father ran Inter in the 1960s, had been president from 1995 until selling the club last year. "Those days were fantastic - players like Franco Baresi, Paolo Maldini and Alessandro Costacurta. "It's a shame because Inter's been such a great club and has a special place in my heart, but losing Massimo Moratti last month was a major blow. "They'll never be the same without him."